After the phtoto-shooting against animal testing took place in the urban ambience of Zagreb's "rocket" skyscrapers for the new Animal Friends' campaign, advertising bills with Bojan Jambrosic are published! Billboards and Citylight posters with Bojan holding a rabbit "rescued from a laboratory" with the slogan "Be Above Cruelty" will appear on April 8 in those 11 Croatian towns: Cakovec, Dubrovnik, Osijek, Pula, Rijeka, Split, Sibenik, Varazdin, Vinkovci, Zadar and Zagreb. The aim of the campaign "Be Above Cruelty" is to draw attention to the cruelty of vivisection, that is animal testing, and to invite the public to buy only products not tested on animals. The white list, or list of companies that do not test their products and ingredients on animals, can be seen at www.animal-friends-croatia.org. Joining in this campaign, Bojan said: "I am very glad to participate in this project, which has a noble goal. I believe that everyone of us wants to save animals from unnecessary killing and torture. I received such an opportunity, which I immediately accepted, hence this is just a small step to draw the people's attention to what happens in laboratories, where because of tests animals suffer and die. All this is unnecessary, especially nowadays when testing can be done in many other ways. I invite everyone to pay attention to the white list and only buy products that are not tested on animals, and this way be an example to others and show that animals did not deserve that. Each of us can make a small step, thus together we do a great thing!" 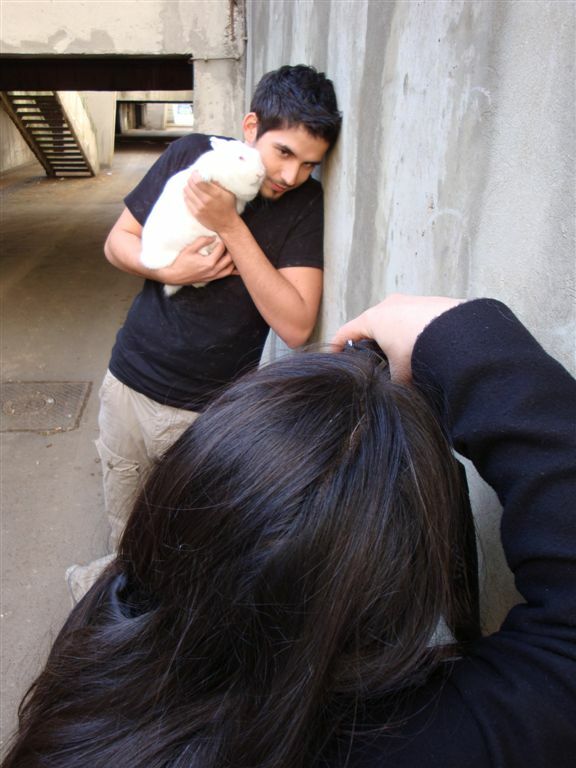 For the campaign, "Be Above Cruelty" the photos were taken by Marina Filipovic Marinshe. Bojan's stylist was Ivan Friscic, his hairdresser Zvonimir Franic, while his make-up artist was Lisa Jericevich. The ads are designed by Maja Zaklan. 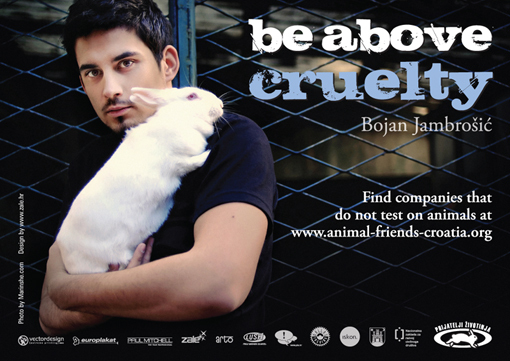 The white list of companies that do not test their products and ingredients on animals will also be available to the public on the new leaflet with Bojan Jambrosic printed specially for this campaign. 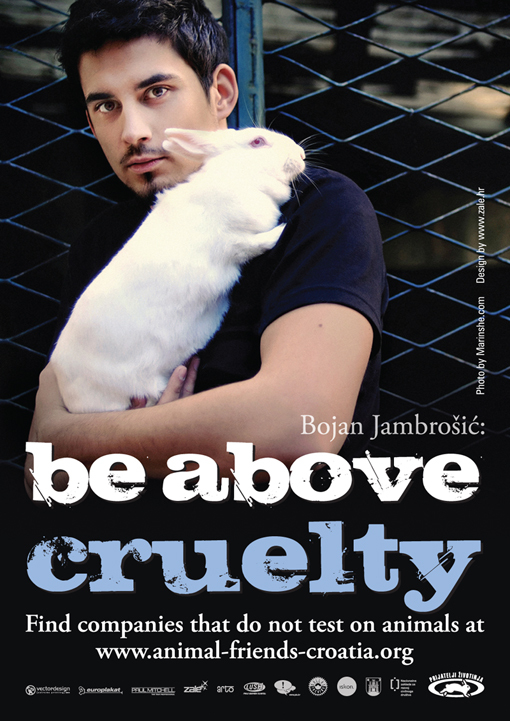 This leaflet with Bojan and details about the continuation of the campaign "Be above Cruelty" will be presented at the special reception of which more information will be posted in a few days. 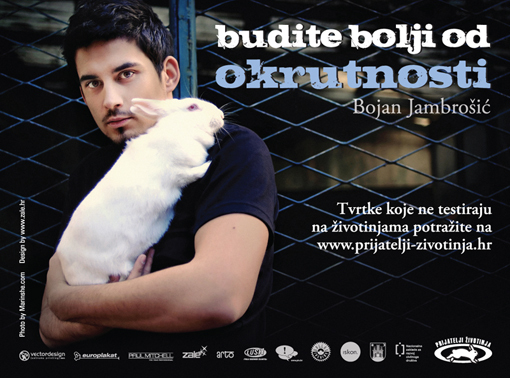 The campaign with Bojan Jambrosic also joined and was supported by Dallas Records, Zale, Vectordesign, Lush, Arto, Paul Mitchell, Europlakat, Melvita, P.I.O., Lotusgraf, National Foundation for Civil Society Development, City Office for Agriculture and Forestry of the City of Zagreb, and Kino Europa.